Chips and salsa: it is a kitchen staple nowadays. Whether a quick snack, or part of a party table spread, this Mexican combo has become a standard in the American edible lexicon. I recently started making my own tortilla chips and salsa, which surprisingly was not as difficult as I imagined. Well, it is a bit more time consuming than opening a bag and a jar, but the extra work is completely worth it. 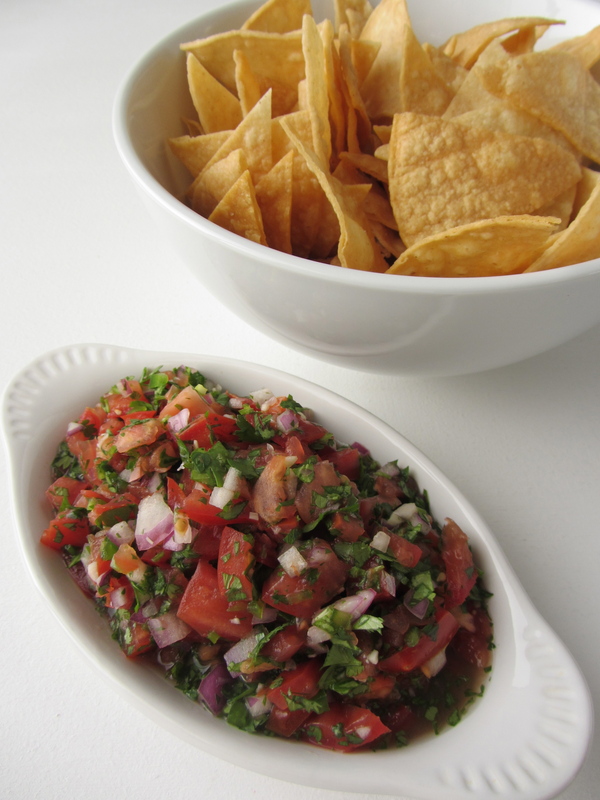 My favorite salsa is Pico de Gallo, also called Salsa Fresca. I like the fresh chunkiness of it, as compared to the liquid sauciness of a traditional salsa. Did you know, the name Pico de Gallo translates to “Rooster’s Beak”? Because of its chopped composition, this condiment originally was eaten using the thumb and forefinger, and the action of picking up this diced salsa resembled a pecking rooster. 1. To make the salsa, combine the diced tomatoes, onion, jalapeno, cilantro, and lime juice in a large bowl. Season to taste with salt and pepper. 2. To make the tortilla chips, heat 1 inch of vegetable oil in a large dutch oven (or deep skillet) to 375F and fry the tortilla wedges in a single layer until they stop sizzling and are lightly golden. Transfer to drain on paper towels, sprinkle with salt while the chips are still hot. 3. Wasn’t that easy? Now go eat! * There are no set proportions for this salsa. Feel free to add less or more of your favorite flavors. You can add in things such as corn, avocado, mango, or pineapple. * If you don’t have a thermometer to test the oil, check it by putting in one tortilla – it should immediately sizzle. * Don’t over cook the chips in the oil. Remember, they will continue to cook from residual heat even after removed from the oil.